This 2 piece heart solitaire ring set is the modern interpretation of simple luxury with its scintillating heart cut center stone and minimalist bands. Made of rhodium plated fine 925 sterling silver. 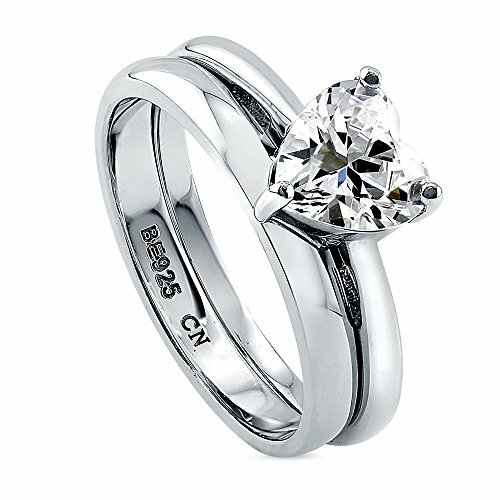 Set with 1.13 carat heart shaped cut clear cubic zirconia (7mm) in 3-prong setting. Bands measure 4.75mm in width. Imported. STYLE: This 2 piece heart solitaire ring set is the modern interpretation of simple luxury with its scintillating heart cut center stone and minimalist bands. Wear the main ring alone for a simpler style or stack on the band for a glam look. Create different looks with this set! STYLE: Engagement - Ideal for engagement, this ring set will be perfect for your special one.